Diablo. Mech Warrior. Every LucasArts game. There are reasons to build an old PC, and no, emulation cannot completely capture the experience of playing these old games. [Drygol] set out to create a retro PC and succeeded brilliantly. The built features an old desktop AT case (when is the last time you saw one of them? ), a 233MHz Pentium with MMX technology, an ancient PCI video card, and an old ISA Ethernet card (with AUI connector). Incoming upgrades will be an ATI 3D Rage PRO, PCI SoundBlaster, and hopefully Windows 98SE. Right now, we’re gearing up for the Hackaday Superconference next weekend. It’s going to be awesome, and we’re going to announce the winner of the Hackaday Prize. We have another contest going on right now – the Enlightened Raspberry Pi Contest. The name of the game here is documentation. Build something, document it on hackaday.io, and you get some cool prizes. 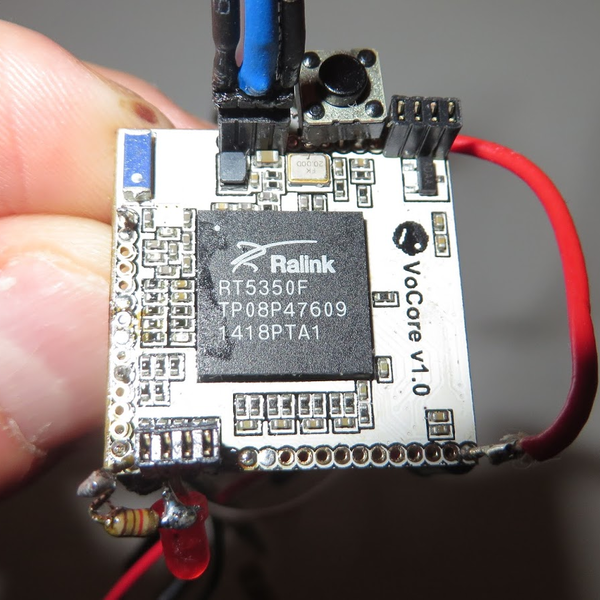 [Vadim] wrote up this short but sweet tutorial on getting started with the Vocore (tiny) OpenWRT-router-on-a-stamp. If you need more computing power than you can get with an ESP8266, and you want an open-source Linux-plus-Wifi solution in a square inch of board space, the Vocore looks pretty sweet. We covered the Vocore a while ago. It has 28 GPIOs, all accessible from system calls in OpenWRT. It becomes much more computer-like if you add a dock that breaks out the USB and Ethernet functionality, but that also doubles the price. Getting started with a no-frills Linux box (chip?) can be intimidating. So it’s a good thing that [Vadim] details a first setup of the Vocore over WiFi and SSH, and then takes you through a button-and-LED style ‘Hello World’ application that makes simple use of the GPIOs. He says he’s going to interface it eventually with a TI CC110 sub-gig radio unit, but that’s going to involve writing some drivers and will take him some time. We’d love to see how to connect peripherals, so we’re waiting with bated breath. [Vadim] also helpfully included an un-bricking script for the Vocore, which restores the default firmware and gets you out of whatever hole you’ve managed to dig yourself into. Basically, you connect to the device over a USB-Serial adapter, run his script, and you should be set. Any of you out there using a Vocore? Or other OpenWRT routers? Give [Vadim]’s tutorial a glance and let us know what you think. Go to DEFCON and you’ll stand in line for five hours to get a fancy electronic badge you’ll be showing to your grandchildren some day. Yes, at DEFCON, you buy your hacker cred. LayerOne is not so kind to the technically inept. At LayerOne, you are given a PCB, bag of parts, and are told to earn your hacker cred by soldering tiny QFP and SOT-23 chips by hand. The Hardware Hacking Village at LayerOne was packed with people eagerly assembling their badge, or badges depending on how cool they are. The badges are designed by [charlie x] of null space labs, one of the many local hackerspaces around the area. The design and construction of these badges were documented on the LayerOne Badge project on hackaday.io, and they’re probably best con badges we’ve ever seen. There are two badges being distributed around LayerOne. The first is an extremely blinkey badge with a Cypress PSoC4 controlling 22 individually addressable RGB LEDs. Most conference attendees received a bare PCB and a bag of parts – the PCB will get you in the door, but if you want your nerd cred, you’ll have to assemble your own badge. There are still a few interesting features for this badge, including an ESP8266 module that will listen to UDP packets and drive the LEDs. Yes, a random person on the same WiFi AP can control the LEDs of the entire conference event. The badges can also be chained together with just three wires, but so far no one has done this. The second badge – for speakers and staff – is exceptionally more powerful. 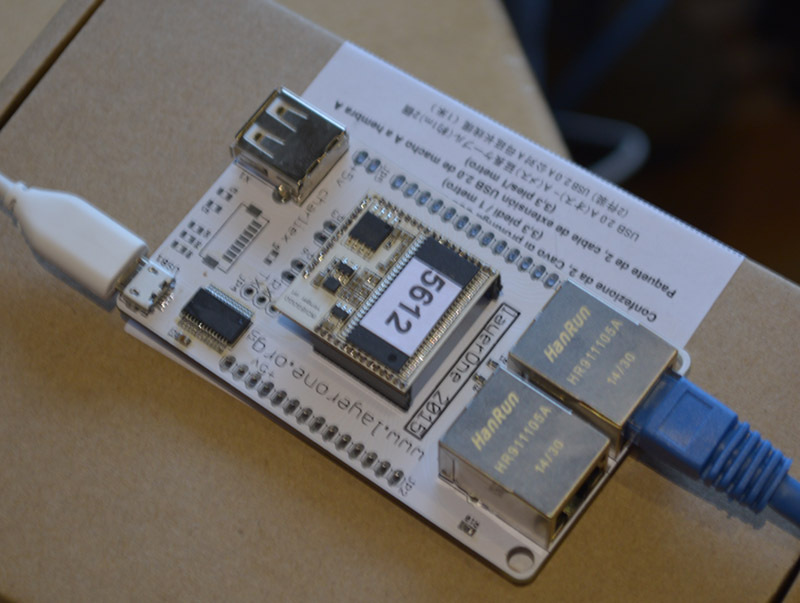 It’s a Linux box on a badge with two Ethernet connectors running OpenWRT. For a con badge, it’s incredibly powerful, but this isn’t the most computationally complex badge that has ever been at a LayerOne conference. For last year’s badge, [charlie] put together a badge with an FPGA, SAM7 microcontroller, SD card, and OLED display. They were mining Bitcons on these badges. The Hardware Hacking Village was loaded up with a dozen or so Metcal soldering irons, binocular microscopes, and enough solder, wick, and flux to allow everyone to solder their badge together. Everyone who attempted it actually completed their badge, and stories of badge hacking competitions at other cons were filled with tales of people sprinkling components on random solder pads. Imagine: a conference where people are technically adept. Amazing. Most of the legged robots we see here are of the hexapod variety, and with good reason. Hexapods are very stable and can easily move even if one or more of the legs has been disabled. [Radomir] has taken this a step farther and has become somewhat of an expert on the more technically difficult quadruped robot, building smaller and smaller ones each time. He has been hard at work on his latest four-legged creation called the Pico-Kubik, and this one will fit in the palm of your hand. The Pico-Kubik runs Micropython on a VoCore board, which allows for it to have a small software footprint to complement its small hardware footprint. It accomplishes the latter primarily through the use of HK-282A Ultra-Micro Servos, an Arduino Pro Mini, and a tiny lithium ion battery. It’s still a work in progress, but the robot can already crawl across the tabletop. This isn’t [Radomir]’s first time at the tiny quadruped rodeo, either. He has already built the Nano-Kubik and the µKubik, all of which followed the first (aptly-named) Kubik quadruped. Based on the use of SI prefixes, we can only assume the next one will be the hella-Kubik! Last May brought the unastonishing news that companies were taking the Systems on Chip found in $20 wireless routers and making dev boards out of them. 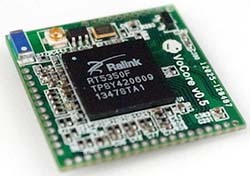 The first of these is the VoCore, an Indiegogo campaign for a 360MHz CPU with 8MB of Flash and 32MB or RAM packaged in a square inch PCB for the Internet of Things. Now that the Indiegogo rewards are heading out to workbenches the world over, it was only a matter of time before someone got Doom to run on one of them. After fixing some design flaws in the first run of VoCores, [Pyrofer] did the usual things you would do with a tiny system running Linux – webcams for streaming video, USB sound cards to play internet radio, and the normal stuff OpenWrt does. His curiosity satiated, [Pyrofer] turned to more esoteric builds. WIth a color LCD from Sparkfun, he got an NES emulator running. This is all through hardware SPI, mind you. Simple 2D graphics are cool enough, but the standard graphical test for all low powered computers is, of course, Doom. The game runs, but just barely. Still, [Pyrofer] is happy with the VoCore and with a little more work with the SPI and bringing a framebuffer to his tiny system, he might have a neat portable Doom machine on his hands.